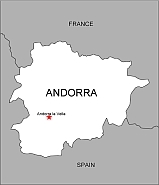 Editable royalty-free map of Andorra in vector-graphic online store. OVERVIEW Andorra is one of the smallest independent countries on earth. Located in the Pyrenees Mountains between Spain and France, Andorra’s terrain consists of gorges, narrow valleys, and defiles surrounded by mountain peaks rising higher than 9,500 ft (2,900 m). There is little level ground. All the valleys are at least 3,000 ft (900 m) above sea level and the mean altitude is over 6,000 ft (1,800 m). HIGH IN THE PYRENEES MOUNTAINS, on the border between France and Spain, nestles the country of Andorra. The country is nominally ruled jointly by the president of France and the bishop of Urgel in northeastern Spain. Catalan is the official language, although many people also speak French and Spanish. 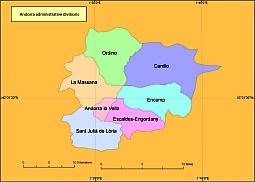 The country’s only large town is the capital city, Andorra la Vella. MOUNTAINS AND HILLS All of Andorra is mountainous. The highest mountain peak is Pic de Coma Pedrosa (Coma Pedrosa Peak), which rises to 9,665 ft (2,946 m) near where the western border of Andorra and the borders of France and Spain meet. Along the northwestern border with France, Pic de Cataperdis (9,203 ft/2,805 m) and Pic de Tristaina (9,442ft/2,878 m) can be found. Pic de Siguer (9,524 ft/2,903 m) and Pic de la Serrera (9,560 ft/2,914 m) lie along the northern border, and Pic de la Cabaneta (9,245 ft/2,818 m) is in the east. Near the southeastern point where the borders of the three countries meet lies Pic d’Envalira(9,268 ft/2,825 m) and Pic dels Pessons (9,400 ft/2,865 m). A lake, Estany de l''Estanyó, and a mountain peak, Pic de l’Estanyó (9,564 ft/2,915 m) lie just east of El Serrat and are accessible only by hiking trail. INLAND WATERWAYS Andorra is drained by a single basin whose main river, Valira River (Riu Valira), has two branches and six smaller open basins. These basins gave the name by which the region was traditionally known, The Valleys (Les Valls). The Valira del Norte is the northwest branch of the main river, flowing through the cities of La Mas-sana, Ordino, and El Serrat. The Valira d''Orient is the northeast branch, flowing through Les Escaldes, Encamp, Canillo, Soldeu, and Pas de la Casa. CLIMATE AND VEGETATION Temperature Andorra has a temperate climate, but winters are severe because of the high elevation. Snow completely fills the northern valleys for several months. During the April to October rainy season, rainfall can be heavy and it is reported to exceed 44 in (122 cm) per year in the most mountainous regions. NATURAL RESOURCES Deposits of iron ore, lead, alum, and building stones are among the resources exploited in Andorra, although the economy depends to a much greater extent on tourism. Andorra’s mountainous terrain attracts about 12 million tourists annually, primarily for skiing and hiking.